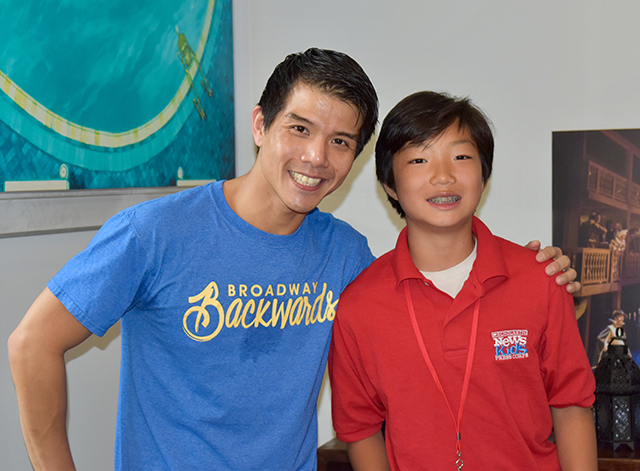 A Magic Carpet Ride | Kid Reporters' Notebook | Scholastic Inc.
Click below to see clips from Stone’s interview with Broadway star Telly Leung. On June 24, the city of Agrabah witnessed a common street rat with a heart of gold go on a quest to better himself and find love. This is the classic tale told in Disney’s Aladdin, which is now running on Broadway. The musical stars Telly Leung, an Asian American actor and singer who has appeared in such Broadway shows as Flower Drum Song, Wicked, and Rent. Before the performance, I got a chance to talk with Leung about his life and career. Here are highlights from our conversation. My name is Telly Leung, and I am currently playing Aladdin in the Broadway production of Disney’s Aladdin. This is my seventh Broadway show. I enjoy singing and dancing and acting, but I also enjoy reading on the beach. I really like quiet time when I’m not performing. Actors lead busy lives, and when I’m not acting, I just like to relax. Has anything ever set you back in your life, and how did you overcome it? When I go to auditions, I get more people telling me no than yes. Sometimes, the reasons have something to do with me. Other times, they have nothing to do with who I am. They have to do with things that are not in my control. I just have to try to not take it personally. How did you get the starring role in Aladdin? Can you tell me about the musical and the character you’re playing? I got the role in Aladdin by walking into a room and auditioning for the part. I had one week to memorize and learn the lines and then come back and show them what I got. Aladdin is a street rat. His mother dies, and he vows to become a better person. The lesson that Aladdin learns throughout the story is that his self worth isn’t necessarily defined by the money that he has. Could you tell us about your first big breakthrough as an actor/performer? My very first Broadway show was a revival of a musical called Flower Drum Song. I am Chinese American, and when it was originally done, it was one of the first all Asian casts. I got the chance to work with some very talented Asian artists. It was special for me because I got to work alongside many artists that I looked up to. What advice would you offer to someone interested in a career in musical theater? I had a wonderful theater teacher, and he taught me an important lesson about theater. Theater is collaborative. You have to do it with other people. Each person’s job is important, and each person’s job deserves respect.